Digital photography has reduced the cost of snapping photos. You no longer have to worry about your children wasting film because they didn’t know how to take good photos. The only limit is the capacity of your camera’s photo card. 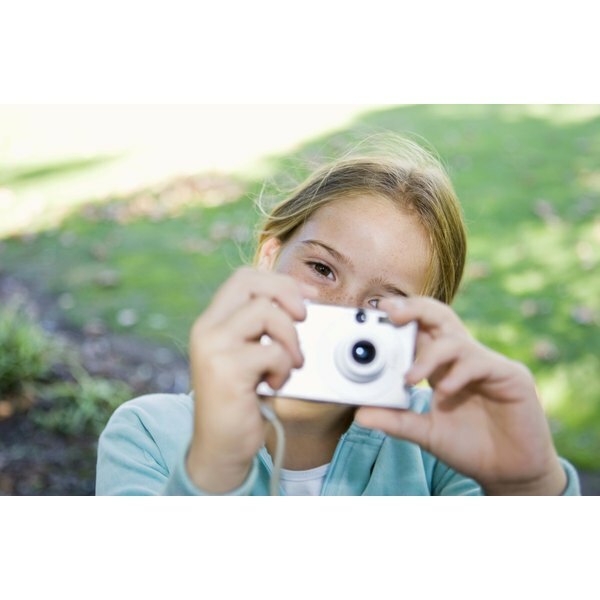 In addition to learning photography basics and how light works, there are many fun activities for kids with cameras. Have your children take photos of their favorite things. They can set up elaborate still-life displays of their toys, dolls, stuffed animals and sporting equipment. Challenge them to be creative. Print and frame the results as mementos to display in their rooms or in common areas. Muslin, an inexpensive cotton fabric, makes a great backdrop. Tape it to the wall and let it drape naturally. Extend it on to the floor or a table to avoid harsh background lines. You can also ask your children to shoot as many different objects they can find of their favorite colors. For example, if green is a favorite color, photograph grass, leaves, peas, dollar bills and anything green. Let children take close-up pictures of objects and places, and have others guess what the photo represents. A close-up of the playground monkey bars, bedroom furniture or the fur of your family pet are a few ideas. They can’t get too close to the objects they’re shooting, or the photos will be out of focus. Download them to your computer and use editing software to crop and enlarge them. Another idea -- ask your kids to shoot the same object from different perspectives. For example, photograph a toy at eye level. Then climb up on a step stool and shoot looking down on it. Shoot it from floor level as well. See how many different angles they can find to shoot the same object. Ask your kids to capture as many different emotions as they can think of with their cameras. Use siblings or friends as the models and ask them to show happy, sad, angry and laughing faces. Funny faces make another great theme. Your children can make scrapbooks of everyone in your family. Let them be the photographers at your next family gathering. Make a list of assorted objects you find around your house, yard and neighborhood. Divide kids into teams and provide a camera for each team. The first team to return with a photo of everything on the list wins. Another activity involves your kids making photo journals of their daily routines. Have them take photos of the things they do during their day, such as playing with friends, reading, eating snacks and going to bed. This activity is great for weekends and summer days when the kids aren’t in school. Search online for photography contests held just for kids. Most will list various categories, such as scenery, animals, people or humor. "National Geographic" magazine offers a trip to Washington as its grand prize.